A friend and I were photographing some of my recent sculptures. A couple of the larger pieces were set-up in the driveway. Well, while shooting pictures of the newest 'Bottle Monster', a huge gust of wind kicked up. 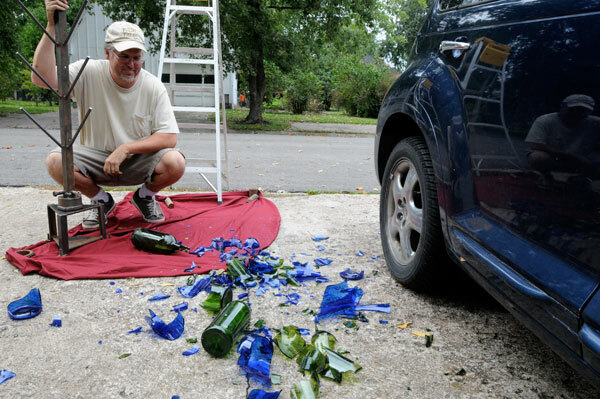 I was standing up on a ladder holding a backdrop, so I could only watch as the sculpture and its eight gorgeous bottles tipped over, banged into the car and smashed to the ground. It was a pretty cool wreck, all the bottles were casualties. But the sculpture stayed strong (I was secretly proud the welds held). More bottles and were back in business.